One of the things I enjoy about "the arts" is the ability to continually stimulate more art. Art imitates life, life imitates art, and art even imitates art. The theme of this post centers on a piece I saw recently at the Art Institute of Chicago. Delving in to find out some background I found a convoluted web of paintings, poems, and etchings inspired from one another. The story starts not at the beginning as in the Bible's first words, "In the Beginning..." but actually in the final book of the Bible; Revelations. 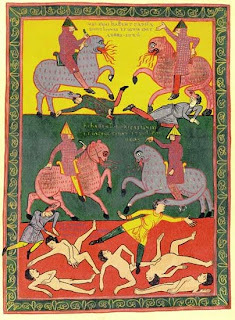 This symbolic and often macabre portrayal of the apocalypse has a chapter in which some seals are opened and four horsemen ride out. While the images of Revelation had been depicted in distilled illustrations as seen in the upper right(taken from a manuscript done in the 11th century) it was Albrecht Durer's "Four Horseman of the Apocalypse" (1497-98) to the left, that first put some macabre drama into the idea. With sudden motion and danger, Death, Famine, War, and Plague come riding across the page. 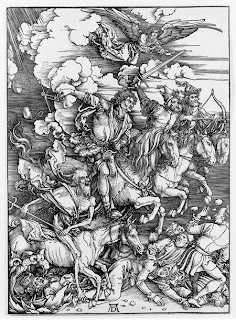 It is widely believed that it is from Durer's image that artist John Hamilton Mortimer got his inspiration for his drawing "Death on a Pale Horse"(1775). He embellished the image further, pulling the horseman away from the group and adding an even more frightening tone. This eerie specter wears no clothes at all./A dreadful crown, reeking of carnival,/sits weirdly on his naked skull. 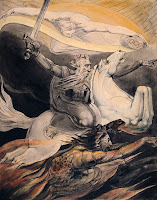 Without/Or spurs or whip, he wears his charger out/ (A ghostly and apocalyptic nag,/ Nose foaming like an epileptic hag)./ The hideous pair plunge ruthlessly through space,/ Trampling infinity at breakneck pace./ The horseman's flaming sword, as on they rush,/ Fells victims that his steed has failed to crush,/ And, like a prince inspecting his domain,/ He scans the graveyard's limitless chill plain/ Where, in a dull white suns's exhausted light,/ Lies every race since man emerged from night. ...Last came Anarchy: he rode/On a white horse, splashed with blood;/He was pale even to the lips,/Like Death in the Apocalypse. 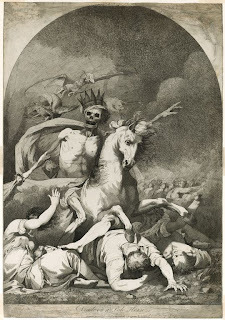 There are certainly other artists inspired by the original Revelation verse, such as Benjamin West's "Death on a Pale Horse" (1796) and J.M.W. Turner's "Death on a Pale Horse" (1825-1830). However, I found it more interesting to trace the inspiration from one landmark piece of work that in turn inspired so many others. I suppose the lesson learned is that you just never know what things in your life will wind up inspiring generations that follow!